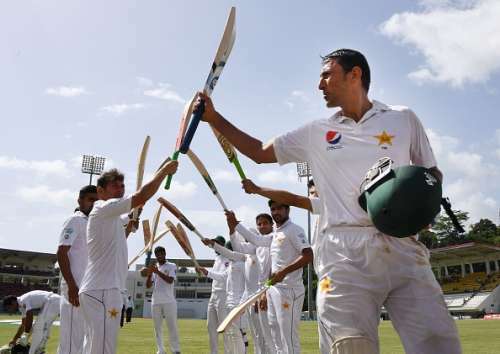 Pakistan survived a top order collapse to put on a healthy target of 304 on Day 4 of the final Test at Dominica. West Indies were 7/1 in reply at stumps after Yasir Shah, who knocked up his career best score of 38 to help revive Pakistan wayward second innings, dismissed Kieran Powell off the last ball of the day. Earlier, Mohammad Abbas completed a maiden five-wicket haul to cut short West Indies' attempt to catch up to the visitors' first innings total. But the hosts' fought back by reducing Pakistan to 90/7 before Yasir Shah and Mohammad Amir put on a 61 run stand to recover the innings. Brief Scores: Pakistan 376/10 and 174/8 dec (Yasir 38, Younis 35, Joseph 3/53). West Indies 247/10 (Chase 69, Abbas 5/46) and 7/1. Here are the talking points from the day's play at Dominica. West Indies had hoped to reduce Pakistan's lead by at least double digits when they came out to bat on Day 4. But instead, they found Mohammad Abbas donning the role of strike bowler. The young seamer bowled Waqar-esque yorkers to send back Chase and Joseph. Chase’s wicket was a strange one as Abbas’ yorker ricocheted off his pads and castled the stumps. Gabriel didn't last long either as Abbas completed a maiden five-wicket haul. The fast bowler has gone from strength to strength in this series and ended it on a high with a searing spell of fast bowling.